With its wealth of protected parks and stunning natural beauty, Costa Rica remains a favorite destination for those seeking adventure. Or for those who just want to get away from it all. As such, use one of these four- or five-star luxury Costa Rica villas to explore this diverse and ruggedly beautiful country. The bottom line is that, with their variety of attractions and luxury services, guests may never want to leave. Charming palapa-roofed villas from one to three bedrooms in size await guests ready to enjoy a relaxing stay at an all-inclusive resort. The on-site spa focuses on reflexology, healing massages, facials, and full-body skin treatments. Two restaurants serve a mix of international cuisine that includes Mexican, Italian, French and Costa Rican. There are also two bars that make use of local exotic fruits in each concoction. Water aerobics, beach yoga, kayaking, and karaoke are just some of the fun activities led by resort staff. Make sure to go beforehand through the reviews of other guests to see if it suits your taste. These wood and glass villas show natural light, ocean views and lush jungle to best advantage, blurring the line between indoor and outdoor living. Comfortable king-sized beds and rainfall showers add luxurious detail. Spa treatments include local ingredients like nutmeg, vanilla, cocoa and sugar. Adventurous tours include waterfall rappelling, whitewater rafting, jungle zip line tours and scuba diving. This piece of paradise has overwhelmingly positive reviews. So make sure to check them out beforehand to see why it deserves to be on your luxury Costa Rica villas list. Enjoy both ocean views and proximity to verdant jungle at the Villa Caletas. This entry on our luxury Costa Rica villas list offers hot tubs or plunge pools amid a private setting just a minute’s walk from the beach. The resort’s infinity pool and stunning fitness room have exceptional views. This will encourage guests to linger long after their workout is finished. Of course, nearby attractions include the Arenal Volcano, Manuel Antonio National Park and Tortuga Island. A range of activities on both land and sea mean there’s never a dull moment. As another greatly reviewed resort on our luxury Costa Rica villas list, make sure to go through the reviews. This will help you make an informed decision before booking a room at this hotel. Villas at this pretty resort come with one to three bedrooms, full kitchens and a generous living area. Some may also feature plunge pools and sea views. Enjoy meals at the on-site restaurant or schedule a private chef to cook a meal in your villa. Fresh seafood makes a substantial part of the menu in Costa Rican favorites and international dishes alike. Enjoy a range of activities or relax at the on-site spa. Tulemar Bungalows & Villas is very well reviewed. All guests have had an out of this world experience at the hotel. Read them carefully, as you will find both opinions and tips in their reviews. Perfect for large parties or weddings, the Barefoot villas offer swimming pools, hot tubs, sea views, multiple guest rooms and all the comforts of a large, luxury home. All-inclusive convenience includes maid service, bartenders, meals and other services. We’re not the only ones saying this. Other guests say this too, just read their reviews and see for yourself. All-terrain vehicle tours, river rafting, deep-sea fishing, spa treatments and golfing are just some of the activities on offer. These sleek and sophisticated luxury Costa Rica villas offer adults-only privacy and a wealth of creature comforts. Glass showers, infinity pools, hammocks and other amenities serve as a relaxing and sumptuous backdrop for a resort stay filled with delicious locally sourced ingredients and healing spa treatments. There’s plenty of adventure to be found nearby, including whale-watching tours, hiking through the rain forest and snorkeling the clear waters. This marvel of the luxury Costa Rica villas is a great place to stay, especially when all guests that have stayed here agree upon this fact. So make sure to read their testimonials for tips and hints on what to do while staying here. With villas that offer plunge pools, kitchens, and up to five bedrooms, guests will never want to leave this secluded paradise. It is needless to say that the sweeping views of the ocean below offer enticement to visit the beaches with their pristine, golden sands. The resort runs a free shuttle service taking guests to the beach whenever they like. There’s also a fitness center with cardio equipment and free weights. And tennis courts that allow guests to work on their serve. Trust us on our recommendations, and also read these guests’ reviews which state that Recreo is a wonderful place to stay at. Exotic garden flowers frame these luxury Costa Rica villas. As such, it is a suitable backdrop for the traditional architecture. Equipped with all the modern conveniences and offering sea views, these private residences have either two or three bedrooms. The infinity pool and swim-up bar make lounging in the sun even more enjoyable. The on-site spa offers treatments in a rustic and peaceful setting. Furthermore, these guests’ accounts about the hotel speak for themselves. So we’ll let you read these reviews to see why. Los Altos de Eros is an adults only hotel with a large swimming pool overlooking the Pacific Ocean. 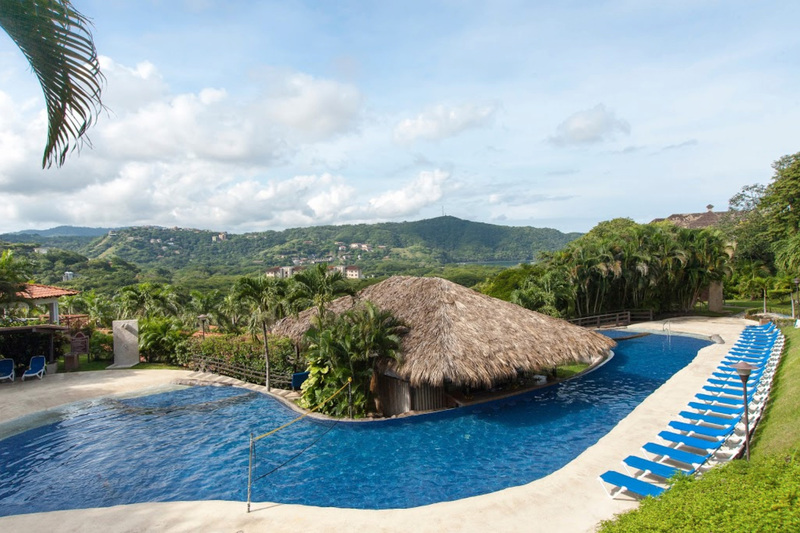 We’ve put on our luxury Costa Rica villas list for two main reasons. Firstly, it is set on a hillside by a 20 minutes drive outside of Tamarindo. The cuisine is one of a kind here, with complimentary breakfast and lunch served daily. Furthermore, it has 2 poolside Queen rooms and 2 poolside King rooms, a detached suite and a second level Eros suite. Secondly, there are a series of activities that guests can enjoy while staying here. You can do yoga classes, or go on eco tours and adventure tours. Not to mention the spa and wellness center, which are top notch. We’ll let guests speak for themselves when we say that they had a great time staying here. The secluded resort of Florblanca villas offers stone tubs for soaking and open-air living rooms. Mind and body harmony are at the forefront of the on-site spa, where wellness treatments, Pilates, yoga and meditation help to restore serenity. Nonetheless, a range of exciting adventure tours will take visitors on various trips. These include deep-sea fishing, horseback riding on the beach, hiking and surfing. The restaurant prepares meals using local ingredients and the catch of the day. Thoroughly read these TripAdvisor reviews as to better make an impression about the resort. Thus, it doesn’t matter whether you love lounging on the beach, playing beneath the waves, or trekking through the dense jungle. There’s surely an exciting adventure awaiting you in Costa Rica. Don’t forget to take time out from your travels to savor the exotic ingredients in local cuisine. Or, maybe, just to enjoy a good pampering in the spa. Also, have you ever stayed in one of these luxury Costa Rica villas? Please let us know a favorite thing about your stay in the comments below. And, if you have questions, we’ll make sure to answer to them. Lastly, don’t forget to subscribe to our newsletter for more luxury hotels top tens.